Lucadello was remembered as “a great judge of talent” in his 32 years as a scout for Philadelphia.7 His pedigree included a virtual All-Star team of Midwestern athletes, including Alex Johnson, Mike Marshall, John Herrnstein, Toby Harrah, Mike Schmidt, and Mickey Morandini, along with Canadians John Upham and Fergie Jenkins. The 19-year-old Jackson began his professional career at Bakersfield of the then Class C California League, posting a record of 4-5 (5.79 ERA) in 1962. The league was reclassified to Single A before the next season, and Jackson improved to 12-8 (3.89) in 1963. A Bakersfield teammate, infielder Lou Garvin, tagged him with the nickname Buck. Jackson’s tenure in Arkansas did not last long. He was called up to Philadelphia on September 1 when the rosters expanded and pitched in his first major-league game two days later in Cincinnati. His baptism at Crosley Field served as proof that he was now pitching in a higher league. Jackson had two short relief outings in April 1966, and was returned to the Pacific Coast League after Philadelphia acquired a pair of veteran starting pitchers from the Chicago Cubs. Fortunately for him, the Phillies had moved their Triple-A affiliate from Little Rock to San Diego. He was recalled again in September, but did not appear in the final month for the fourth-place club. Still, in 1967 he was in the major leagues to stay. By now the Phillies were an aging team and Jackson had hoped there would be room in the rotation for a young left-hander to complement Jim Bunning, Chris Short, Larry Jackson, and Ray Culp. Jackson did not like relief work and, according to Allen Lewis of the Philadelphia Inquirer, he “seldom did well coming out of the bullpen.”16 At the end of the 1968 season, his lifetime record was 4-10. The National League expanded to include two new teams and Jackson was disappointed that neither San Diego nor Montreal claimed him in the expansion draft. He wanted the opportunity to prove himself as a starting pitcher and was not getting it in Philadelphia. Gene Mauch was fired as the Phillies’ skipper two months into the ’68 campaign. Under new manager Bob Skinner, Jackson was able to correct his delivery and improve as a pitcher. Unlike many young pitchers, often accused of pitching too quickly, Jackson’s workmanship was considered too slow and deliberate. Jackson’s newfound poise earned him a berth as the Phillies’ representative at the 1969 All-Star Game in Washington. In what would be the only All-Star selection of his career, Jackson did not appear in the NL’s 9-3 victory at RFK Stadium. Despite a season record of 14-18, Jackson had earned the respect of both his coaches and his peers. “He makes a lot of good pitches now and he doesn’t waste any time,” observed Phillies catcher Mike Ryan. “Get it and throw it, that’s the way he likes to pitch. We used the simplest signs when he’s pitching so as not to slow him down.”22 Jackson’s personal life was developing as well. While playing winter baseball in Puerto Rico, he met and married his wife, Milagros. Grant and Milagros had three children and lived year-round in Puerto Rico for much of his playing career. Entering the 1970 season, the Phillies were rebuilding with Frank Lucchesi now as their manager. Jackson’s record in 1970 regressed to 5-15 with a 5.29 earned-run average. Frustrated at the lack of progress of his club, Jackson finally received his wish on December 16, 1970, when the Phillies traded him along with utilityman Jim Hutto and outfielder Sam Parrilla to the defending World Series champion Baltimore Orioles for outfielder and prized prospect Roger Freed. Never again would he post a losing record in the major leagues. “I like to start,” he told Lou Hatter of the Baltimore Sun. “That’s where the money is. ... On the other hand, working out of the bullpen you’ve got to have a whole lot of saves, keep the earned-run average low, and slip in a few wins to get a big contract.”24 Though he did not register any saves in 1971, Jackson posted a record of 4-3 with a 3.13 ERA as the Orioles secured their third consecutive berth in the World Series. He pitched two-thirds of an inning in Game Four; both the game and the Series were 4-3 losses to the Pittsburgh Pirates. The 1976 Yankees did, in fact, win their first American League pennant since 1964. Jackson contributed a record of 6-0 with an earned-run average of 1.69.30 But his postseason record was not up to his usual standards, as he surrendered five earned runs between the American League Championship Series and the World Series. In November 1976 the Seattle Mariners “surprised everybody” by selecting Jackson in the expansion draft.31 Jackson never pitched an inning for Seattle; he was traded to Pittsburgh in December. The Pirates had won division titles in five of the previous seven years which translated into only one world championship. Competing with the Steelers’ NFL dynasty, the Pirates drew sparse crowds to cavernous Three Rivers Stadium. It was clear to new general manager Harding Peterson that second place was no longer good enough for the Pirates fans. Clad in their new disco-influenced black and gold attire, the Pirates raced toward the divisional lead in April and May before settling once again for second place. As Jackson remembered, it was a special season when the Pirates “had the best bullpen in baseball. Remember Goose Gossage? Terry Forster? [Kent Tekulve] and myself? All of baseball was saying if you got past the fifth inning and we were winning, you lost.”34 Indeed, the Pirates and their bullpen were credited with 34 wins and 39 saves in 1977. However, for the second year in a row, they finished in second place behind Philadelphia. With Forster’s departure to the Los Angeles Dodgers as a free agent, Jackson became Chuck Tanner’s left-handed specialist in the bullpen. The Pirates fine-tuned their roster by trading the popular veteran outfielder Oliver to the Texas Rangers for starting pitcher Bert Blyleven and first baseman-outfielder John Milner in a four-team transaction during the winter meetings in December 1977. 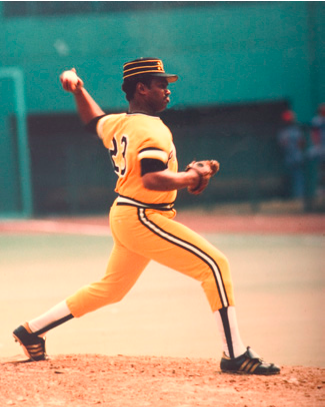 Sanguillen was reacquired from Oakland while hard-throwing pitcher Don Robinson was promoted from the minor leagues. Despite another fine season by Jackson out of the bullpen, the Pirates finished once again in second place, once again behind Philadelphia. The fans responded by staying home as the Pirates drew fewer than one million in 1978. True to the message of their theme song, “We Are Family,” the Pirates jelled as team with Stargell as the “Pops.” They went on to win 16 of their next 26 and vaulted into the pennant race by mid-July. Grant Jackson remained confident that he could get anyone out, no matter which side of the plate they faced.36 In 72 appearances, he went 8-5 with 14 saves and an earned-run average of 2.96.37 Once the Pirates returned to contention, it was not the Phillies but the Montreal Expos who gave them the most trouble. Jackson proved central to a critical moment of the season for both clubs. After the Pirates acquired Bill Madlock in a blockbuster deal with the San Francisco Giants, the Expos, in the words of general manager John McHale, “had to counter” by trading for Rusty Staub.38 A folk hero in the early years of the franchise, Staub made his first plate appearance in Montreal as a pinch-hitter on July 27. A sellout crowd of 59,260 gave Staub the most raucous standing ovation ever awarded to an Expos player.39 With the Pirates ahead 5-4, two outs and a runner on in the eighth inning of the first game of a twi-night doubleheader, Staub faced Jackson amid a backdrop of deafening noise. Proving his statement that nothing ever bothered him, Jackson enticed Staub to slap an easy popup to Dave Parker in right field to end the inning. Pittsburgh won three games out of four in Montreal, making a statement that their early-season futility was little more than an aberration. 1. Ron Musselman, “Baseball Very Good to Jackson,” Toledo Blade, June 19, 2005. 3. “Seizure Fatal to Joseph Jackson,” Findlay (Ohio) Republican-Courier, June 20, 1960: 15. 7. Fergie Jenkins, and Lew Freedman, Fergie: My Life from the Cubs to Cooperstown (Chicago: Triumph Books, 2009), 34. 8. Allen Lewis, “Rookie Jackson Front Runner in Race for Phil Starter Berth,” The Sporting News, April 9, 1966: 24. 11. Doug Brown, “Jackson a Stone Wall as Oriole Fireman,” The Sporting News, January 18, 1975: 50. 16. Allen Lewis, “Speed-Up on Hill Puffs Out Jackson’s Victory Bag,” The Sporting News, May 24, 1969: 21. 20. Bill Ranier and David Finoli, When the Bucs Won It All: The 1979 World Champion Pittsburgh Pirates (Jefferson, North Carolina: McFarland, 2005), 175. 24. Lou Hatter, “Jackson Shelves Curve to Outflank Bird Foes,” The Sporting News, July 7, 1973: 15. 29. Dan Epstein, Stars and Strikes: Baseball and America in the Bicentennial Summer of ’76 (New York: Thomas Dunne Books, 2014), 175. 31. Jack Lang, “Youth Has Its Fling in A.L. Expansion Draft,” The Sporting News, November 20, 1976: 34. 32. Willie Stargell and Tom Bird, Willie Stargell: An Autobiography (New York: Harper & Row, 1984), 180. 33. Rich Emert, “Where Are They Now? Grant Jackson,” Pittsburgh Post-Gazette, August 29, 2002. 34. Mike Mastovich, “Talking Baseball: Ex-Big Leaguers Entertain AAABA Crowd,” Johnstown(Pennsylvania) Tribune-Democrat, August 10, 2009. 36. Lou Sahadi, The Pirates (Markham, Ontario: Fitzhenry & Whiteside Ltd., 1980),129. 38. Maxwell Kates, “The Expos Emerge,” in Elysian Fields Quarterly, Vol. 23, No.4, 2006, Tom Goldstein, ed., 49. 39. Alain Usereau, The Expos In Their Prime: The Short-Lived Glory of Montreal’s Team, 1977-1984(Jefferson, North Carolina: McFarland, 2013), 58.